â€œRico Suaveâ€ (wouldnâ€™t give his real name) is 32. 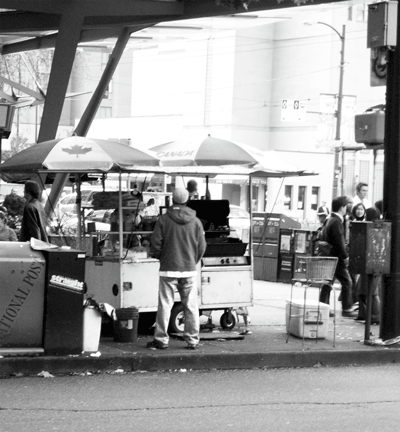 He works at the hotdog stand on the southeast corner of Robson and Burrard. Only: How often do you work here? O: Six days a week? What hours? R: Itâ€™s kinda open. My uncle and I got a few locations throughout the city weâ€™re kinda working ourselves. Probably average out over a six day span, six to eight hours maybe. Myself. O: And you and your uncle own how many locations? O: And that one across the street? O: So thatâ€™s a rivalry? O: But itâ€™s not a real rivalry, is it? R: Absolutely. Effectively it is because theyâ€™re taking customers away. O: So what do you do to try to counteract that, if anything? R: Itâ€™s not about changing prices as much as trying various things, like deals. You got McDonalds, you got a meal every day. A special every day. We try to do that. Weâ€™re here more often and frequently than they are. They take days off like you wouldnâ€™t believe. Weâ€™ve got a good regular customer base. O: What is your best seller? O: And what is your personal favourite? O: What have you learned while selling hot-dogs? R: Iâ€™ve learned a lotâ€¦ Iâ€™ve learned to treat each grill as an individual, because theyâ€™ve got different characteristics. Each grill cooks smokies differently, I know that. As far as practical stuff? I treat customers in a different way now. Iâ€™m learning all the time. Absolutely.